​ filmed and can seen on YouTube and my Facebook page." and back. Since then, I have become addicted to Middle Eastern music and dance. 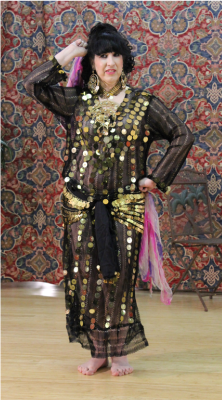 ​ teach belly dance classes at the Community School of Music & Art in Ithaca, New York. When not dancing, I am probably working at my day job (controller at a retirement community), spending time with my family, keeping fit, practicing the doumbek (a Middle Eastern hand drum), or doing some reading." and live music performance in the Greater Syracuse area. music, I play Klezmer, folk-rock, Celtic music, blues and jazz. SABA 30th Birthday Bash show was a highlight of 2018!" "1976 is the year I began belly dancing. I took three different classes each week regularly. Instructors included "the greats" - Cassandra in Minneapolis, Aziz in Salt Lake City and Angelica Nemeth in Los Angeles. In time I performed regularly in nightclubs, two to three nights a week, in Seattle and Minneapolis. In the past few years I have developed an interest in flamenco; I am now studying this dance style as well. I am a founding member of SABA. In addition to being the Treasurer for many years, I have been the Vice President as well. Many of my long-term friendships began through SABA." was a teenager and took me to a class. We danced together and the rest is history! I love performing and have been a very successful entertainer in the Syracuse area. to award winning Scottish Highland dancing and an interest in Flamenco. the first festival of its kind in the northeast. ​administrator and most recently, Publicist. I'd have to say my favorite SABA activity is performing for seniors; I love the big smiles on the faces of the residents." "Over the last several years, I have found belly dance to be a unique outlet. energy into the dance. It is a big confidence builder as well. SABA Vice President and President in addition to dance coordinator. ​ members and seeing new costumes and hearing new music."